Make your own tortillas, or choose from a vast array at your local grocery. Tortillas may be one of the first items us “north of the border” folks think of when referring to Mexican food. The word means “little cake” and that’s what they are: a flat unleavened round of corn or wheat flour. Tortillas rival pasta in terms of popularity in America. Perhaps, like noodles, it’s because of their versatility; one can add almost anything to the edible platters, then fold them in a number of ways before baking, grilling or frying them. They are the canvas one uses to make burritos, chimichangas, enchiladas, flautas, quesadillas, tapa, flauta and tacos. Add garlic cloves in the last minutes of roasting time. According to wikipedia, maize (corn) is the most planted crop in Mexico, and the primary way it is eaten is in corn tortillas. In northern Mexico and much of the United States, wheat tortillas are more often produced and consumed. And, like pasta, as the tortilla has mainlined into global kitchens, it has diversified. 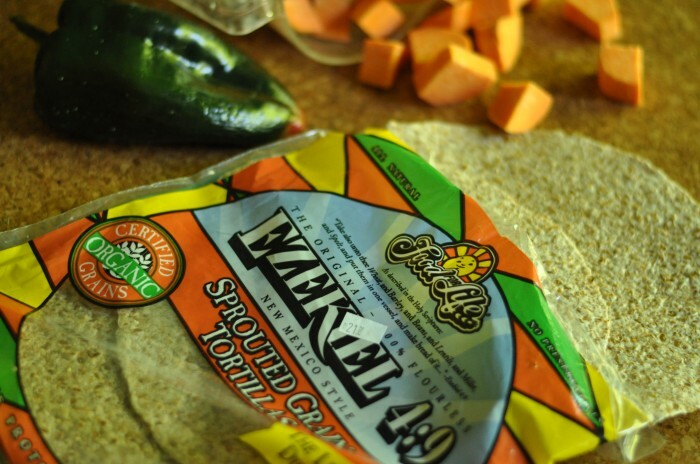 Shelf-stable vegetable-infused tortillas line grocery shelves. You’ll discover recipes that use lavender or chocolate tortillas, for example, in cookbooks and on-line, and fanciful, exotic tortilla-based dishes can be a restaurant’s signature dish. 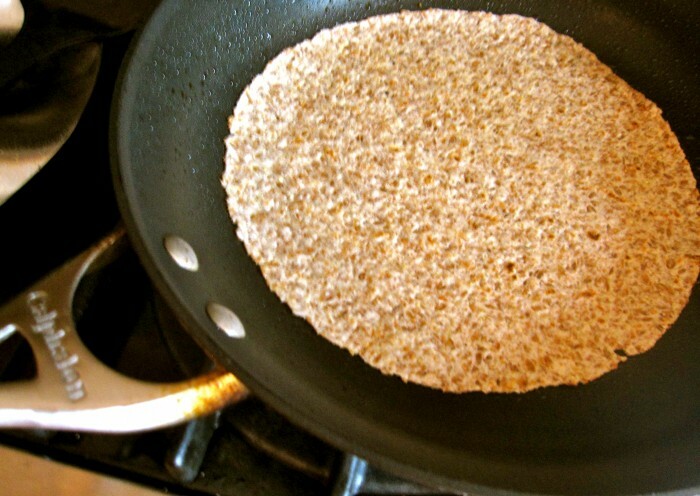 In groceries with a focus on health, one finds grain and legume versions incorporating sprouted millet, lentils, spelt and barley woven into the tortillas. Trying to find ways of sneaking more fiber and healthy grains into my family’s diet, I used Ezekiel Sprouted Grain tortillas to make enchiladas in the following recipe. 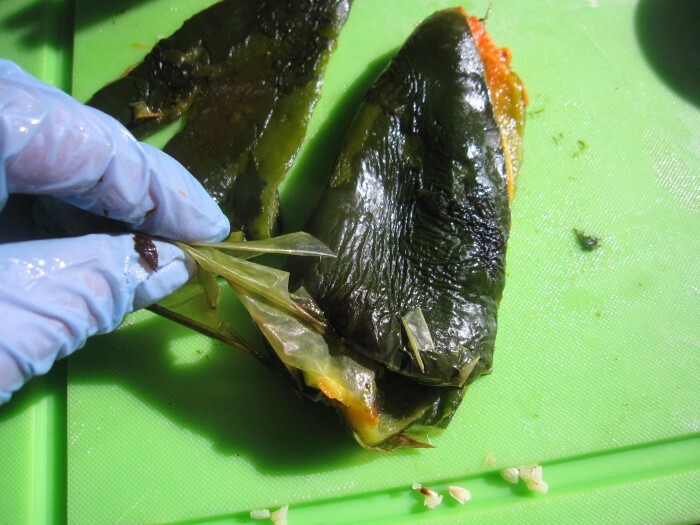 Peel off skin from poblano and remove seeds and membranes w/plastic gloves. With that pronouncement, the disclaimers follow. I would never suggest this recipe to be an example of a classical Mexican enchilada. To my palate, the tastiest and most authentic Mexican tortilla-based recipes — dripping with unctuous, salivating flavors and texture — roll their eyes at cholesterol counts. To achieve this symphonic rapture, scratch-made corn tortillas often use fatty meats and unprocessed lard (pig fat) for cooking and coating the beans. Regional artisan cheeses — often difficult to procure in America — are used as well. Savoring them, preferably accompanied by a margarita and an oceanic lullaby from the Sea of Cortez, is a transcendental experience. Briefly soften tortilla in an oiled, warm skillet. Inspired by Seva Restaurant’s popular Enchilada Calabaza, made with butternut squash and corn tortillas, I used cream cheese to bind the sweet potatoes and beans. The sprouted grain tortillas I used were toothsome, flavorful and resilient, but may be too hearty for some palates. Ann Arbor.com’s Jessica Webster wrote an article in March extolling the ease of making your own tortillas from scratch. 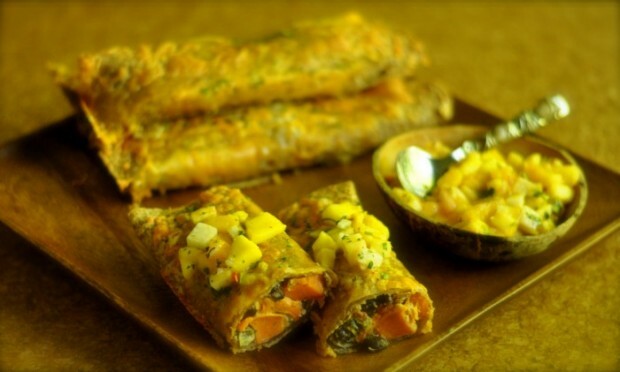 You may use any type of tortilla in the following recipe: homemade, vegetable-infused, whole wheat, white or corn. If desired, substitute the cream cheese with a fresh Mexican cheese, such as queso panela, fresco or blanco cheese; or skip the salsa and blanket the casserole in a spicy tomato sauce before adding the cheese. My recipe is merely a template for you to mess around with. Mound a heaping half cup into lower third of tortilla. To save time, I purchased a freshly prepared Pineapple-Mango Salsa from Whole Foods, which was excellent, particularly with the crunch of fresh jicama incorporated into the recipe. However, it’s a cinch making fruit salsa, and the abundance of Champagne Mangoes filling grocery bins around town inspire. Simply dice the sweetest, ripest fruit you can find, and season to taste with lime juice, red onion and cilantro. If the following recipe is not necessarily a recipe Grandpa Gonzales would endorse, my family thoroughly enjoyed the enchiladas, happy with their healthful components, and the economy of preparation time and budget. My world for a tortilla. Place sweet potatoes and whole pepper on a foil-lined sheet pan. Rub pepper with oil and coat sweet potatoes with oil or cooking oil spray. Place on middle rack of oven and roast 10 minutes. Remove from oven, turn poblano pepper over, and place garlic cloves on pan. 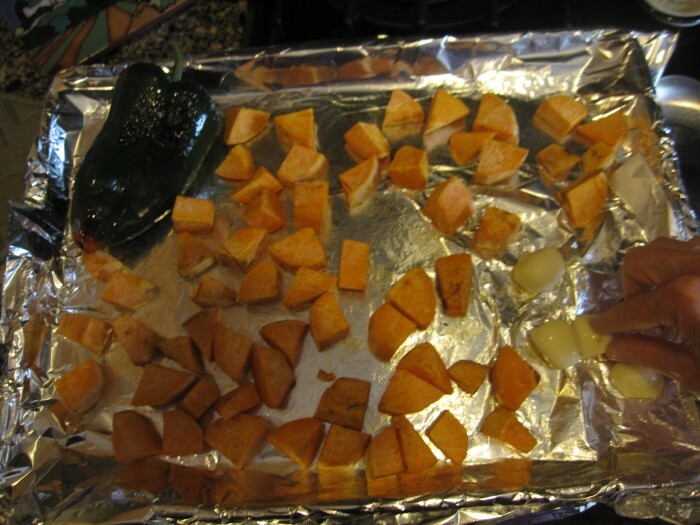 Continue roasting five to 10 minutes or until poblano is blistered and sweet potatoes and garlic are tender. Reduce oven temperature to 350 degrees, and oil a baking dish large enough to accommodate 6 rolled enchiladas. In a sautÃ© pan large enough to accommodate tortilla, heat 1 teaspoon oil. Heat both sides of one tortilla until softened, about 20 seconds per side. Place the tortilla into the oiled dish. 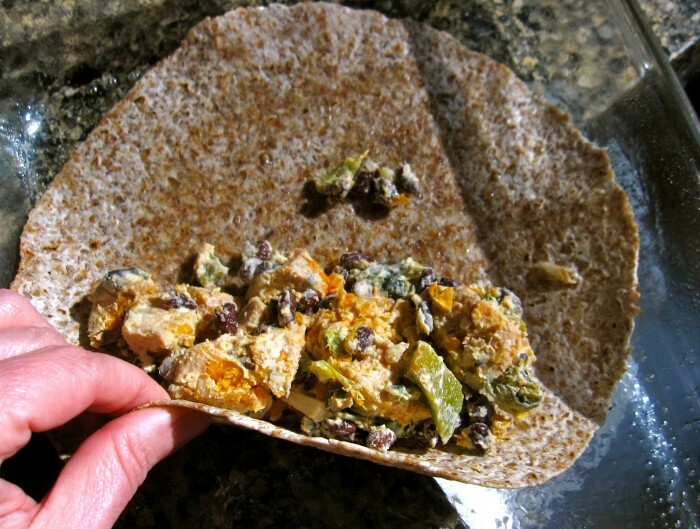 Spoon a heaping half-cup of sweet potato mixture 2 inches away from bottom of warm tortilla and mold into a cigar shape. Roll up the enchilada, seam side down, and place it at the far end of the dish. Repeat warming each tortilla, adding more oil to pan if needed, then stuffing and rolling the remaining tortillas. 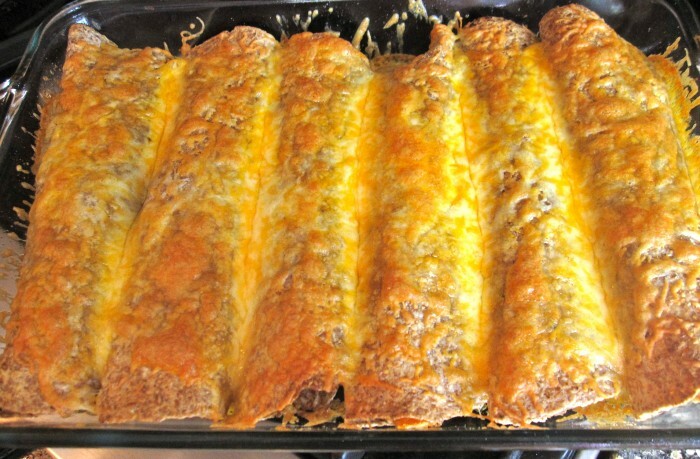 Evenly blanket enchiladas with cheese. Bake on center rack of oven until enchiladas are bubbling and heated through, 15-20 minutes, or until cheese is melted and golden. Garnish with fresh fruit salsa, chopped cilantro and serve.